Your mission is to be the first player to get rid of all your dominoes each turn and therefore end up with a score of zero. All other players must count the number of pips or “dots” on their remaining dominoes and record their score. The player with the lowest score at the end of twelve rounds wins. 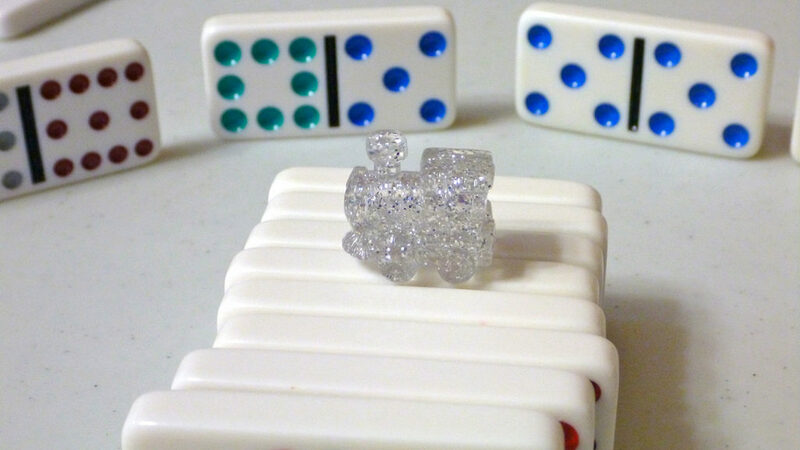 Just like with the Farkle dice game, you can at the very minimum play Mexican Train using any standard set of double twelve dominoes and an object to use as a train marker, from a button to even perhaps a colored paperclip to distinguish each player. The number of dominoes each player gets changes depending on how many people are playing but in a two player game you’ll each be picking up fifteen dominoes. The rest of the dominoes remain face down and are put into a pile called the “boneyard”. You’ll be up and running in moments but you will also need a rather large playing surface, especially if you decide to involve more players. There are several different sets of Mexican Train sold in stores depending on whether you’d like something inexpensive, something you can easily take anywhere or a fancier version. I shelled out for a fancier version that comes in a wooden box and includes the set of dominoes, a wooden “engine” and a set of small die-cast trains that are used as the markers. There are twelve rounds in Mexican Train. You’ll need the double twelve domino to start things off and each round you’ll start with a lower number (i.e. : a double eleven for the second round, a double ten for the third round) until you reach the double blank, the final round. The double twelve is placed in the middle of what is called the “engine” which is a circular object with grooves to place your starting domino which as you might guess must be a twelve. The dominoes you play are considered the trains and you’ll be building your own line that can twist and turn just like a regular game of dominoes. The difference here is that other players will also be building their own trains. On your first turn you can play as many dominoes as you can match and since you’re trying to be the first person to go out, it’s important to strategize and figure out how to make the most of that first turn since you’ll only be able to place one domino each subsequent turn. There will likely come a point where you won’t have a domino to put down. In this scenario, you must randomly draw one from the boneyard. If you still can’t play a domino, your line becomes “public” and you must place one of those aforementioned train markers to designate that your opponents are free to play their dominoes on your line. In order to make your line private again, you must be able to play a domino on it. Having your line public is generally a disadvantage since it means there is a greater amount of lines where your opponents can play and thus get rid of their dominoes. On the other hand, if someone plays a domino that will allow you to play your own hand, it could be a temporary advantage but you generally want to make sure that your line stays private as much as possible. Doubles have their own set of rules in Mexican Train but also present a potential to go out quicker. Any player who puts down a double must “satisfy” the double by immediately playing another domino with a matching number. You can kill two birds with one stone so to speak. However, if you don’t have a domino to satisfy the double, it must be satisfied before anyone can play anything else. This can not only ruin any strategic moves your opponents may have, but it could also force someone to make their lines public. Basically, if you intend on playing a double you’ll be doing everyone a favor by also being able to satisfy it in the same turn. It’s important to note that you can’t exactly bluff in Mexican Train in the traditional sense. If you have at least one domino that can be played, you must put it down. You can’t intentionally withhold a domino during your turn in order to foil your opponents. I’ve come across websites that suggest players can, in fact, choose not to play on their own lines so you can always throw in that option if you’d like to add a greater degree of strategy to the game. We can’t forget to mention the Mexican Train itself. The train is played on its own separate line and can be optionally started by any player at any time after everyone has played their first turn. Unlike a player’s line, the Mexican Train is always open and can be played on by any player at any time unless you’re trying to satisfy a double. Starting the Mexican Train can simultaneously work for or against another player since it gives you another line to play on and thus get rid of your dominoes but it also means that you may unintentionally help your opponent. I’ve found Mexican Train to be a very entertaining variation on the classic game of dominoes. Although it’s essentially the same time-tested game at its core, the light strategy involved when it comes to where to play your dominoes adds a bit of risk and necessary forethought, especially if more than one player has an open line. Since the game is played in several rounds, it’s not something like Farkle that you can play within a short amount of time, especially if only two players are involved. I took it along with me on a road trip and we split the full twelve round gaming sessions over three nights but I can unquestionably say that we had a great time playing it as a relaxing way to end the day. I highly recommend shelling out the extra dollars for a premium version of Mexican Train. It makes for a nice addition to your game collection and will certainly look good if you decide to keep it on your coffee table.